The unscrupulous attempts by RTG Mining Inc. to undermine BCL’s position regarding the Panguna project have been further exposed in the PNG National Court. RTG, a junior speculative company, pre-empted the court to declare in an ‘announcement’ to the ASX (Australian Securities Exchange) on 5 December that a dispute over the chairmanship of the Special Mining Lease Osikaiyang Landowners Association (SMLOLA) had been resolved “and all Court actions will now be withdrawn and come to an end”. Mr Philip Miriori and Mr Lawrence Daveona had both laid claims to the chairmanship but reportedly reconciled their differences on 5 December in favour of Mr Miriori. In a further announcement yesterday (12 December), RTG stated: “we can now advise that the discontinuance papers have also been lodged with the Court, bringing the dispute to a formal end”. These statements were unqualified and ignored the fact that the leadership dispute was subject to an ongoing mediation process imposed by the National Court and presided over by Justice Kandakaski. The statements were clearly designed to undermine BCL’s application for the extension of its project area exploration licence (EL1) by creating the false impression that BCL had no support among key project area landowners. The matter however returned to court on 8 December and was adjourned until yesterday afternoon (12 December) after lawyers for Mr Miriori failed to appear. During yesterday’s hearing, rather than being brought to “a formal end” Justice Kandakaski ordered that the mediation process continue. This is to determine whether the reconciliation between Mr Miriori and Mr Daveona resolved the dispute to the satisfaction of the broader SMLOLA membership. Following three earlier mediation sessions in Panguna, a fourth session has now been scheduled for 29 January 2018, before a return to court on 6 February. These developments are not only deeply embarrassing for RTG but expose the highly misleading nature of its ongoing campaign of de-stabilisation against BCL. BCL also rejects RTG’s anti-BCL characterisation of Monday’s Warden’s hearing in Panguna. The hearing formed part of the application renewal process. The Warden provided the opportunity for the community to express its views regarding the application both for and against and for BCL to present its case for renewal. Importantly, BCL believes it retains strong support among the 367 Customary Heads who are authorised to act on behalf of the customary owners of the 510 land parcels in the EL1 area. The application process continues with a decision expected shortly and BCL respects this process. In the interim, the term of the exploration licence is taken to have been extended until the application is determined. Again, an egregious attempt to undermine BCL’s standing both locally and internationally. The truth is BCL has a full-time team in Bougainville with 11 staff working constantly on the tenement, this includes a Panguna-based senior project officer. 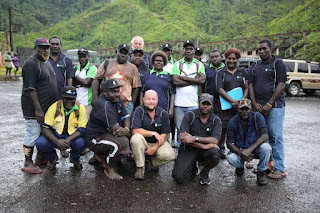 BCL re-commenced its formal engagement in Bougainville back in 2012 after the Autonomous Bougainville Government (ABG) and landowner associations invited a new process and in 2014 made its first visits to Central Bougainville. Since that time BCL has actively engaged with communities in the Panguna and broader historical BCL mine lease areas and has also undertaken six customary processes and has been well-received overall. It should be noted that despite RTG’s attempts to undermine BCL’s position, RTG has no apparent support from the ABG or apparent necessary support among the Customary Heads authorised to act on behalf of the landowners.